- A sufficient amount of sunlight streaming in. - Bright corals of various colours. 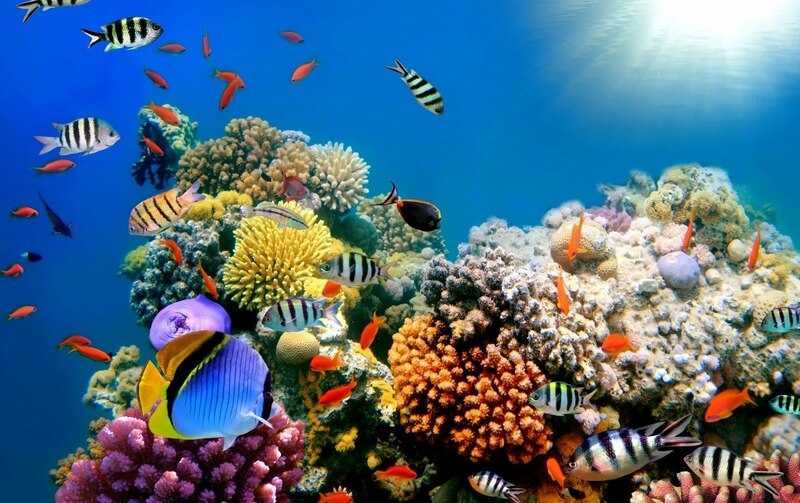 - Fishes and other sea-life of various bright colours. - Do such locations still exist and are they open for amateur/beginner scuba divers or snorkelers who are just traveling on vacation? - Or is my question just wishful-thinking, and is the reality that all scuba diving/snorkeling locations (corals and water) are the dull blue/green type? I'm asking because I'd like to scuba-dive or snorkel (no experience yet), but all vacation spots I see, have pictures of very dull looking reefs and sea-life. Go in the right season, to the right site and you should enjoy a bright vibrant dive. 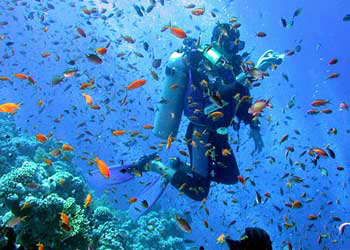 To answer your questions: Yes, such places exist, my favorite is the Red Sea, Eilat, Israel. You can find peaceful water reserves, with lots of fish and corals in snorkeling depth. There are also many diving schools around the shore. You're mostly observing differences in the pictures, not the locations. These might be deliberate - wanting to emphasize peaceful blue, or vibrant colour differences - or accidental due to photographer skill, camera equipment etc. There are places where coral is bleached (ocean acidification and climate change are killing coral) and some reefs are more colourful than others, but the default "scuba or snorkel over coral" experience is brightly coloured and visually fascinating. Also, even "mostly blue" is still dramatically amazing. If you've never swum through a cloud of fish, drifted over a clam larger than you, or seen the shapes and textures of coral up close, don't assume that all they have to offer is colours. An actual list of places where the colours are bright would be far too long and offtopic on this site. Your best bet is to do a broad search for locations that are reasonably accessible for you and then investigate further. For example, you might hear that Fiji has nice diving. Look into the non diving aspects of Fiji - do they sound appealing? Are there easy and inexpensive flights from where you live, or do you have to change planes three times to get there? Then try another location and do the same. Once you've chosen a country, then you can start trying to determine the "best" particular island, bay, or reef within that country to see what you want to see. 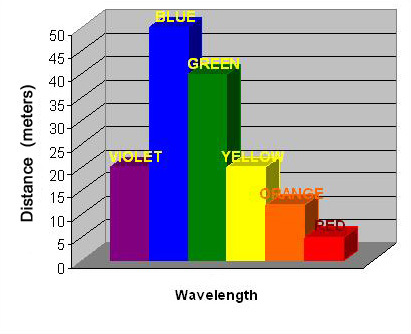 According to this site the problem is that various wavelengths penetrate to different depths. Blue penetrates further hence photos more than, say, 10m deep are predominantly blue. If you wish to see the full colour range while diving, this must necessarily be done in shallow depths unless you used artificial lighting. Hence, you should restrict your searching to locations where the coral depth is shallow. The second photo has the saturation cranked way up. The first photo actually does a good job of portraying what you will likely see if you are scuba diving at depth. Some of the fish have very good colour, these are nearer the camera so some sort of flash has illuminated them. Fish/coral/diver that are further away get less benefit from the artificial light from a flash so result in a more "typical" dive look which is blue saturated due to the penetration of water by different wavelengths as covered in other answers. Not the answer you're looking for? Browse other questions tagged diving vacations or ask your own question. How does the scuba diving compare between Coffs Harbour and Byron Bay? What places offer both good scuba diving and surfing? What is a good place in Goa to stay with a beach and scuba diving? Where is the coldest commercial diving site? Is there any visibility and currents database/website for scuba divers? Is Sydney good for scuba diving? Options for Scuba Diving in Northern Italy? In the Grenadines, how could you get scuba tanks for diving if already on a boat? Comparison website for scuba diving prices?